Knitting Trends I’m Unraveling Over – Old Salt Craft Co.
Before I get started, I should note: this list is not to say that bright neon brioche and captivating speckled fades are “out”! Alas, we were blessed with the Comfort Fade Cardi just months ago! However, it appears the pendulum may be swinging in the other direction, as these trends are a bit understated and simple in comparison to previous trends. Or perhaps I’m just maturing in my tastes? After all, this is a list I created based on what I’m personally reaching for, so please don’t fret about not seeing your favorite technique, design, fiber, or color on this list. With recently released designs such as Joji Locatelli’s “Like a Cloud” and the increasing popularity of Shibui knits “Silk Cloud” (60% goat mohair and 40% silk), this super soft fiber is showing up everywhere, especially when held double with a finger weight merino. Thanks to the increased prevalence of “knitting local” and a growing reverence for learning more about the special animals that provide our yarns, more and more knitters are appreciative of the “wooly wool” with which our great grandmothers would be familiar. Cozy, mindless knits like Andrea Mowry’s “Weekender” pullover and the recently released “Lotta” sack dress by Marie Greene, make this type of wool even more comforting and nostalgic. Bring on the positive ease! A trend that seems to be hitting both the fasion world and knitting world (always nice when the two intersect), is a boxy fit such as that of the recently released “Boxy Tee” by Karen Peacock as well as the increasingly popular Tegna Sweater by Caitlin Hunter, which is also currently on my needles. 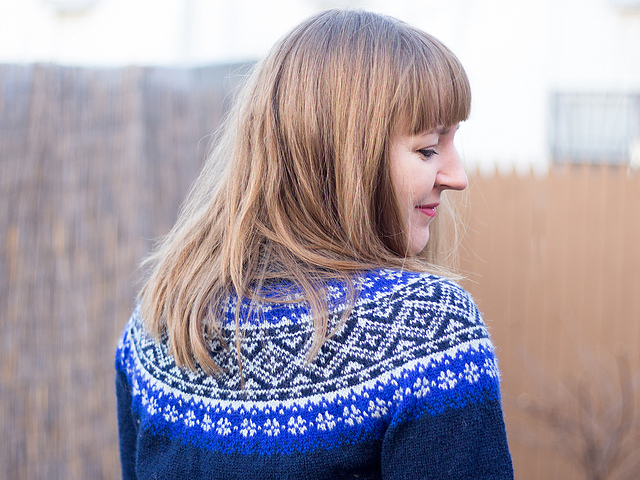 Perhaps “Caitlin Hunter” deserves her own item on this list, but with the growing popularity of patterns from the designer behind Boyland Knitworks (i.e. Sunset Highway, Zweig, and Tecumseh), she really has brought renewed life to this generations-old technique. This bodes well for new sweater designers such as Ellie of “Skeindeer Knits” who has blessed us with her very first stranded colorwork yolk pattern: Vinterfjell. I personally hope to see many more like it from Ellie. 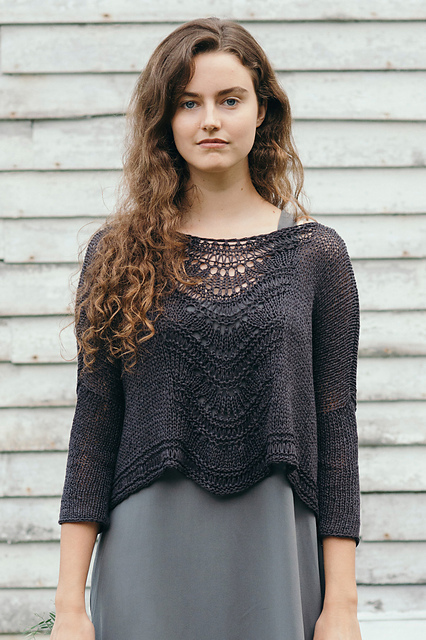 Also – I’m planning to knit Threipmuir by Ysolda Teague as my Rhinebeck sweater this year. Gradient effects in colorwork have long been represented in the traditional Fair Isle designs; however, they seem to be showing up in surprising ways lately – including mosaic knitting! Perhaps this is how we solve the “What do I do with all these mini skeins” problem or maybe more gradient skeins are coming onto the scene. Regardless, one example is the recently released “Impossibly Possible” socks by Lisa K. Ross – a pattern that was released as part of an e-book entitled “Socks of Wonderland,” which has an Alice in Wonderland theme. It seems that many of the newly released boxy designs are also quite cropped as well, which no matter your body shape can actually have a surprisingly flattering effect (and if it’s not your preference, it’s usually easy to make a garment a few inches longer). 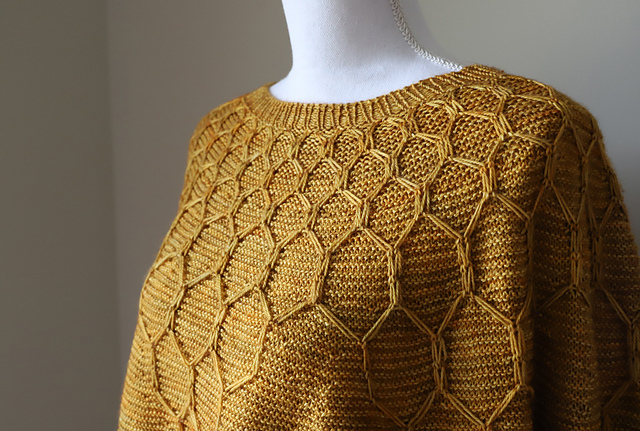 This is represented well in the Deschain top by Leila Raabe, a pattern that has really become very popular with the knitters at my LYS, the Perfect Blend Yarn and Tea, and I’m beginning to think I may just need to cast on if only just to fit in (at least that’s a good excuse!) This trend seems to be popular when paired with a flowy dress underneath – something I never would have thought to do on my own! This is one trend I haven’t yet had the chance to put to practice, but I’m eager to do so! Joji Locatelli strikes again with her recently released “2 Color Socks” – a fun pair of stripey, lacy socks. One of my favorite designers has long been a fan of this combo – Melanie Berg’s “Whiteout” shawl is a stunning model of the trend. Another great example is the Dream Lake Shawl by Julia Decker – which actually has a little bit of everything (including 2-color brioche) to keep you interested both while knitting and admiring the FO. I’m thankful to see these colors outlast the fall season, which is where we usually tend to see them, because they have long been year-round favorites of mine. 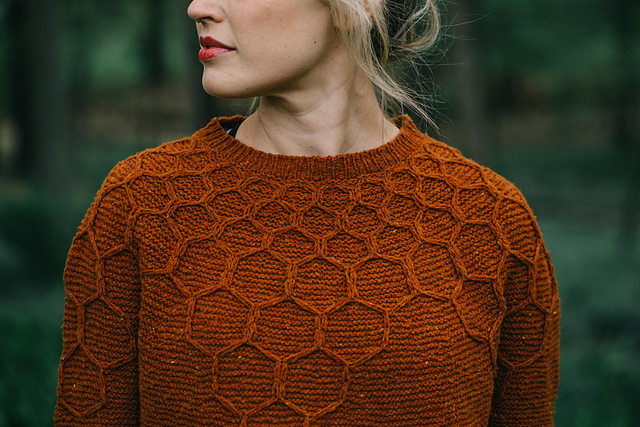 Andrew Mowry’s newly released, “Wool and Honey,” is perfect for either hue – seen below in both (notice it’s slightly cropped, uses rustic wool, AND has a somewhat boxy fit)! 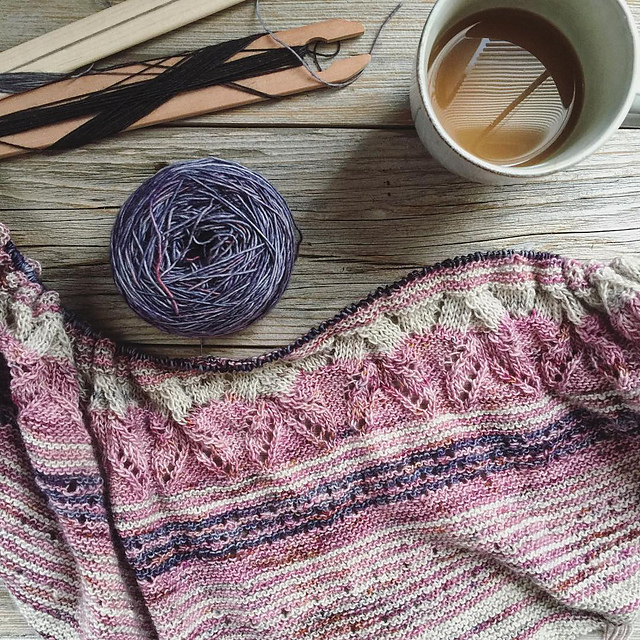 As a side note, honey gold, when paired with grey and light pink, make a lovely combination, as in Isabell Kraemer’s “A Girl’s Best Friend” shawl. The 2018 Pantone Color of the Year is Ultraviolet, and it has shown up in patterns like Joji Locatelli’s Fading Point Shawl as well as the Marsh top by Amy Palmer, pictured below. And as for mauve, I will always associate the hue with the ever-talented Kristin of Voolenvine Yarn. I just adore how she incorporated a darke shade of ultraviolet and a pinky mauve into her Impressionist Shawl, by Helen Stewart – oh, and is that lace and stripes I see there, too? and… what else did I miss??? Next The Longest Day Make-a-Thon!